This past February I had the opportunity to paint in Arizona for a week, and I couldn’t resist the allure of the Superstitions. I had painted them once before, from a client-provided photograph, but seeing them in person was a different story. The dust in the air turned them even redder than they were naturally. Overall, a super-natural treat! 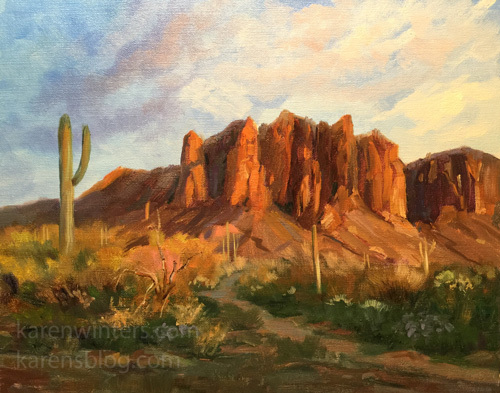 I have a new website page dedicated to just my paintings of Arizona, New Mexico, Utah – wherever you find beautiful canyons and red rock scenes. You’ll find paintings of the Grand Canyon, Zion National Park, Monument Valley – and paintings of Arches National Park, Canyonlands, Bryce Canyon and Canyon de Chelly to come.